After a unanimous vote, Royal St George’s Golf Club in Kent has lifted its ban on female members. A decisive 90% of members voted in favour of altering the rules. The club, 14-times a host to The Open Championship, issued a statement saying it looked forward to welcoming ladies as junior and full members. More than 81% of the club’s members took part in the ballot. 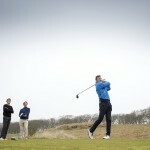 “It is extremely good news going forward,” said Tim Checketts – Secretary at Royal St George’s. Dame Laura Davies, who recently became one of the first female members of the Royal and Ancient Golf Club, said it was good to see the Kent club following suit. “It would seem to be the correct thing for a club that hosts a big sporting event such as the Open,” she said. St George’s has welcomed significant women’s competition in the past – in 1988 the club was host to the Curtis Cup. Two remaining Open venues in Scotland have male-only membership policies – Muirfield in East Lothian and Royal Troon in South Ayrshire, which has separate men’s and women’s clubs. At the end of January, Royal Troon announced that it would “shortly undertake a comprehensive review to consider the most appropriate membership policy for the future”.